"I recently ordered a couple of bandanas for my German Shepherd, Bear, after not being able to find cute things for larger dogs to wear in the stores. 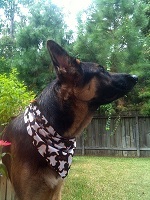 They are good quality bandanas, able to withstand the wear and tear of a 14 month old GSD. I just washed the boo ghost bandana yesterday and it came out looking new! Thanks for making such cute, high quality apparel for big dogs. I'll definitely be back for more!" 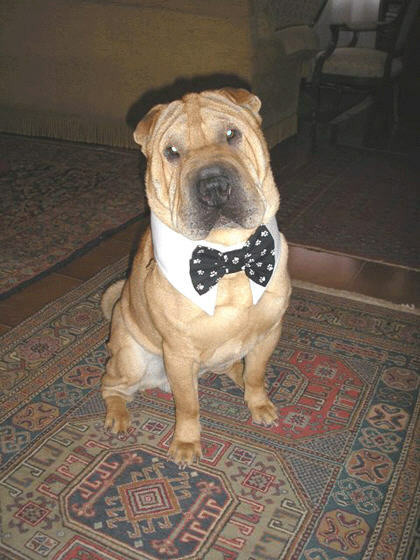 "I received the collars and ties I ordered today, just wanted you to know how impressed I am. Not only is the quality better than expected, but your customer service is like no other. The fact that you included the extra collar to make sure we have the proper size blew me away. I will be mailing back the unused one tomorrow. I have alot of friends and family who likes to dress their dogs so I will definitely sharing my experience with them. Thanks again for everything and I look forward to getting our 4 dogs halloween costumes from you." 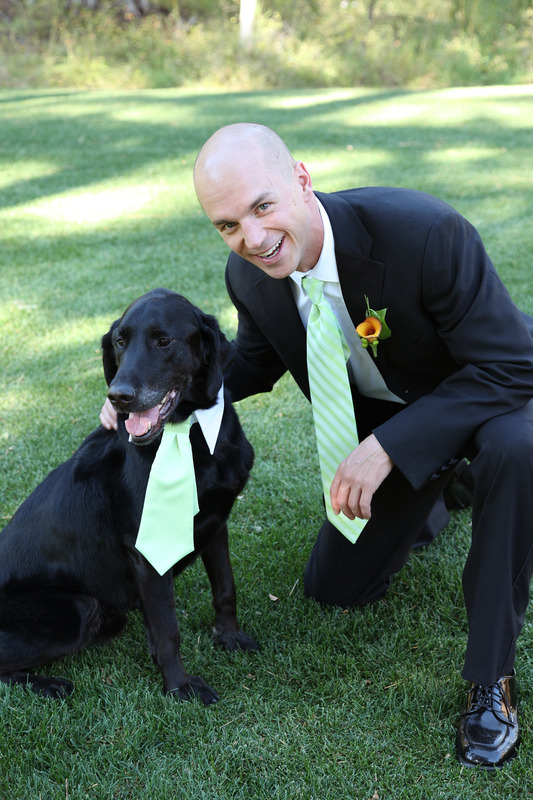 "Just to let you know that both the necktie and a bowtie you made for our dog blew us away. Thank you so much - what an appearance our puppy made at the wedding!" Debbie - I can't tell you how much we appreciate you...the collars and ties are BEAUTIFUL!!! Little Yoda looks great in his - I'll send you a picture as soon as I can, but Deb , you went above and beyond what we expected of you. We are overwhelmed by your thoughtfulness and your concern, especially in today's marketplace where everyone has an edge. I am so happy we found you and will definitely send others your way...and we thank you for all the doggie-party-supplies. We're going to have a blast! God Bless! "I just wanted to say thank you so much for such wonderful customer service! I’m getting married in a couple of months and have been absolutely appalled at the service I have received at many stores. It was so nice to get the phone call to make sure all the information was correct. I received my dog collar in just a couple of days and it fits perfectly! Once again thank you, dealing with your company was a breath of fresh air!" "I ordered these ties for my wedding, I think he's going to be the most elegant of all ;) I'll check back your website constantly for more things, they're so cute! I find you are so professional in everything you do--- no flattering --- thank you again for your support and best of luck with your business!!" "My dog, Halle, loves her fleece mat on top of her bed. I like the way the mat keeps the bed clean and all I have to do is wash the mat. Unfortunately, Halle, loves her mat so much, she protects it and won?t let me put it in the laundry!" "Your collar & bow tie arrived today for my greyhound, Joe......it fits perfectly and he looks very debonnaire!!! Terrific collar!!!" "I buy your bandanas all the time. My cat, Morrie, and his canine cousin, Oliver, wear them!! I really like your products. Meow and Woof Woof." Send us your testimonials - we love your dog photos!